A current undergraduate senior at the University of Pennsylvania, Natalie is passionate about women’s empowerment and has worked on the issue from various perspectives. Most recently, she serves as the Managing Director of the Hong Kong chapter of Girls in Tech, a 50,000-member global nonprofit that aims to support women in tech. As an Investing-in-Women Fellow at the Wharton Social Impact Initiative, Natalie is researching the new field of gender lens investing in edtech. This past summer, Natalie was also a Pulitzer Center International Student Reporting Fellow, conducting onsite research in Mumbai and Rajasthan for the topic, “India’s Innovations in Gender Equality”. 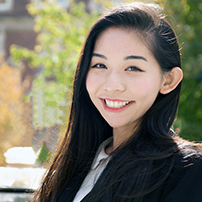 Previously, she interned for Mother’s Choice, a reproductive justice nonprofit in Hong Kong, and was also on the board of a Penn student nonprofit that advocated and raised funds for women’s empowerment worldwide. Her most recent publication was an article on Forbes about the advice that inspirational women in tech would give to their college selves. She is excited to continue learning about different ways to achieve gender equality!